NOTE: This book was written by my friend and colleague, Dean Kilmer, who died suddenly and unexpectedly in August 2018. Dean had a website through which he sold his book. When Dean's family decided to close down the website after his death, I asked for - and was granted - permission to move his book to my online store, so that it will still be available for people to purchase and read (because it's a really good book), and to help the family liquidate the stock of books that Dean still had on hand when he died. Proceeds from sales of Dean's book on this site will be forwarded to Dean's family. Integrity: We love the concept, but when push comes to shove we would rather be on the winning team. Has political correctness made cowards out of people who have real moral character? Will the tidal wave of negative values continue to destroy the moral fiber of America? Are we destined to be a nation of abused children, broken homes, abortions, and homosexuality? No! That is not America! We are a people of great moral fiber who have been pushed aside by the disruptive voices of a minority made up of radical immoral people. 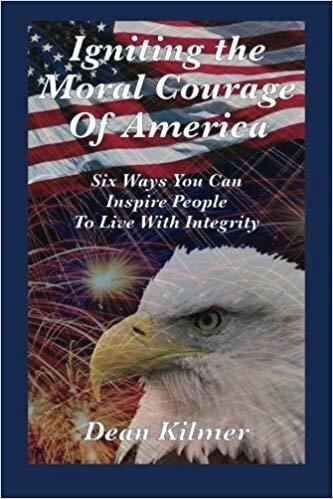 This book, Igniting the Moral Courage of America: Six Ways You Can Inspire People To live With Integrity, provides examples of how ordinary people just like you and me can have a powerful impact on the morality of future generations. While most Christians wonder what they can do about the negative trends in our country, this book reminds us that God does not call the qualified; He qualifies the called. From the 92 year old widow with cancer whose story has inspired the lives of thousands, to the average football coach who changed the lives of hundreds of his players, to the reformed alcoholic who converted the meanest man in town, God is working! This book documents the moral problems facing our country as it presents the long-term solutions for these destructive behaviors. Although our challenges appear complex, we are reminded while life’s problems are extremely complex the solutions are simple. The solutions are found when one person allows the power of God to work in his or her life! Igniting the Moral Courage Of America starts in reverse. While most books begin with the foundation, we begin with the challenge and build though the solutions toward the powerful conclusion. The real foundation for life and morality is our God as He is revealed in the Bible. God’s absolute truth coupled with His amazing grace is the solid foundation that energizes good people. The real power is God working in you! You will be empowered by God to change your surroundings. While people who lack faith live “under the circumstances” of life, people of faith change the circumstances by God’s power. This book is an exciting, 50,000-word ride into purposeful living. You will discover your own personal mission in life as you learn exactly how you can accomplish that mission. When your mission and God’s power come together, you will have a dynamic impact on people in our nation!